Slouchy Knit Beanies Just $10.95 PLUS FREE Shipping! Down From $20! You are here: Home / Great Deals / Slouchy Knit Beanies Just $10.95 PLUS FREE Shipping! Down From $20! I don’t normally wear hats, but, these are too cute – I may have to change my mind! 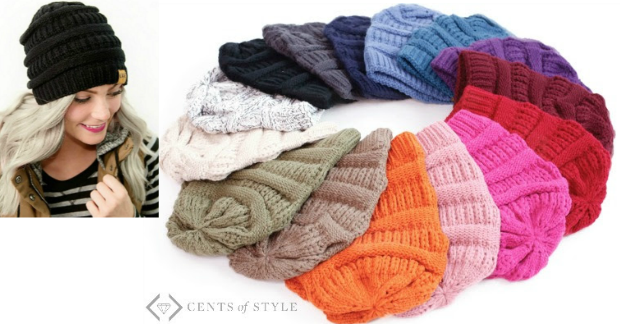 These Dempsey Slouchy Knit Beanies come in a multitude of colors and they are just $10.95 PLUS FREE shipping! They are normally $19.95 but when you use code: BEANIE16 at checkout you’ll get them for just $10.95 PLUS FREE shipping! This deal is only good today 10.17/16 – so hurry don’t miss out!